It was another fantastic year at Shaker Woods! The weather was spectacular and the variety of crafts is always impressive at this show. Here are some photos from immediately before the show opening. That's my daughter Taya photo-bombing the third photo below. The witchy shoe pinkeep in the foreground is a pattern by Peach Bottom Primitives and the pattern can be found on Etsy. The pinkeeps sold out. 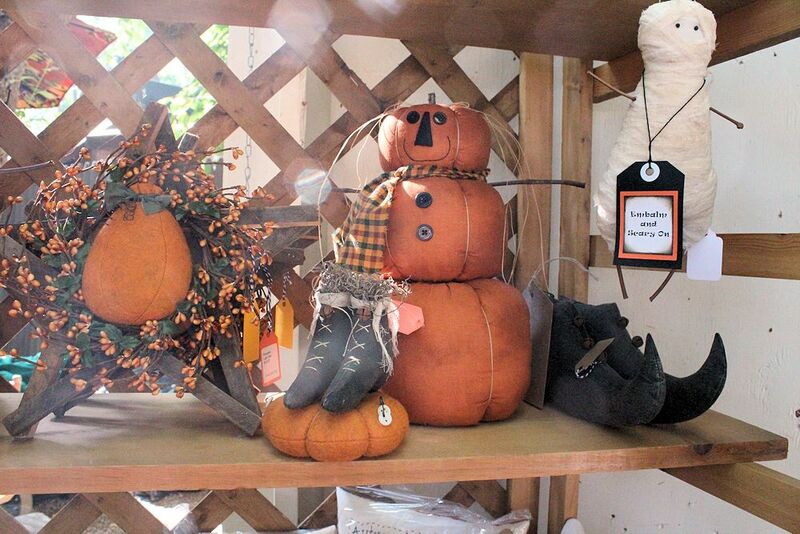 The pumpkin guys also sold out quickly -- they were made from a 2001 pattern by Bunny Hugs. The candy corn in the basket on the left are made from one of my all time favorite patterns by Sassafras Hill Primitives. The crows on bamboo sticks also sold out quickly. They were made from another very cute (and easy to make) pattern by Peach Bottom Primitives. The eggs were from a wonderful pattern by Sweet Meadows Farm. The snowman stars were also a customer favorite. They're made from Warm and Natural and they're easy to make up so they can be sold at a reasonable price. I had several folks who purchased multiples for teacher and co-worker gifts. The little snowmen on the fabric covered paper mache boxes (toward left center on top of the crate) were made from a really easy and fun pattern by Country Friends. The flag bowl fillers are always a hit. Over the last winter I did some stitcheries and turned them into pillows for autumn. Many of the designs are from Chestnut Junction. The raggedies are made from several Sweet Meadows Farms patterns. Doesn't that cat on the candy corn naturally bring a smile? Another great pattern by Maureen at Sweet Meadows Farm. The pumpkins with the curly stems were an adaptation of a pattern by Tickled Primitive. My daughter Revere made the pumpkin pies -- muslin crusts sprinkled with spices and stiffened with pumpkin-colored felt as the filling. Even a little twist of white felt whipped cream on top! Another big hit were these sunflowers in tin cans. The pattern is from Sweet Meadows Farm and the labels can be found on Etsy by Ewe and Me Printables.